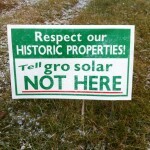 A group of home owners in Rutland, Vermont felt obligated to form an organization for responsible solar power development when a proposal by GroSolar, a solar farm development company, chose a site for the largest solar farm in Vermont in their neighborhood. Whether the members approved or not of solar power, they couldn’t sit by as the city planners allowed development to proceed with no input from Rutland residents. Why Rutland residents should be asked to forego their democratic rights is frustrating to say the least. Calling Rutland The Solar City and Vermont’s state goal of 90% renewable power sources by 2050 may be a steps in the right direction, but are they license to push through every project called solar? Visit their site to get all the details and sign their petition if you feel so inspired. I developed their site with a simple and clean objective. They have a blog where you can comment and you will find many news article links. It will help to have a Rutland Herald online subscription to view them all.